When translated from French faux bois means fake wood. Traditionally the practice of the faux bois technique involves highly specialized sculptural skills. However, concrete contractors are coming up with other ways to replicate the look of wood. 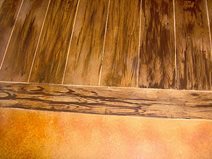 Some use stamps, others use scoring and staining and still others allow the natural grain of real wood boards to leave an imprint on the surface of the concrete. No matter the method, contractors are becoming skilled at using concrete to mimic the look of wood, but with improved durability. Browse pictures of concrete projects that replicate wood. ESPJ Construction in Linden, N.J.
Wood stamps are becoming a popular choice for homeowners who like the look of wood decking but don’t want to deal with the upkeep and deterioration. Not only is wood stamped concrete more durable than actual wood decking, but it won’t cause splinters on bare feet. To create an authentic wood look, this pool deck was stamped with a wood plank pattern and colored with a tan dry-shake color hardener accented by a dark brown release agent. Learn more about this project: Concrete Pool Deck Replicates Wood Planking. Baltz and Sons Concrete Services in Somerville, TN. The owners of this property wanted a koi pond in their side yard, but in order to provide walk-through access a footbridge was necessary. In order to avoid extensive maintenance, concrete was selected as the best material. The arched bridge was poured in place with boardwalk stamps set in the form. It was colored with acid stains and topical highlighting oxides and sealed for protection and slip resistance. Read more: Concrete Footbridge Looks Like Wood. Allstate Decorative Concrete in Cokato, MN. The owners of this home wanted a deck, but without all the maintenance that wood requires. Stamped concrete helped them achieve the look they wanted and a surface that is about as maintenance free as you can get. The concrete was integrally colored and textured with a stamp that replicates pine planks. The result is a deck with a weathered wood appearance from the start that never changes. 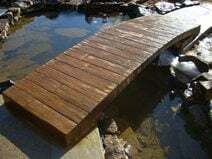 To learn more about this project read Wooden Plank Walkways from Concrete. Concrete Creations in Plymouth, IN. 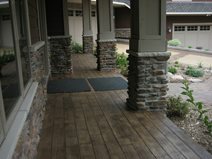 A wood plank stamp was used to impart the texture of real boards to this patio. 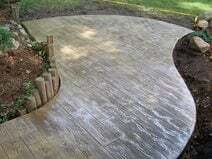 This is a great way to get the rustic look of a deck without all the upkeep. When selecting a stamp for your project, look for one made from actual wood planks for the most realistic grain patterns. Stamped Artistry in Pasadena, TX. This outdoor kitchen at a Texas ranch was full of rustic details. 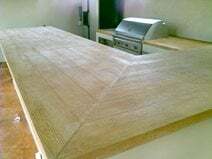 Robert Salinas, a contractor who had done other work on the property, suggested making wood-grain concrete countertops. The countertops were precast in molds lined with HardiePlank siding panels. The concrete was integrally colored with an ivory pigment and antiqued with an espresso stain to mimic natural cedar. Read more: Wood-Grain Countertops. Concrete Solutions in San Antonio, TX. Wood floors may not always be the best option, like for these homeowners who wanted they look of wood, but the durability of concrete. Their contractor started by cutting offset joints in the floor to create the appearance of boards. Then he stained the floor and ran a graining tool over it. The end result is a smooth surface that looks three-dimensional, as if it were stamped. To learn more about the process: Concrete Floors Look Like Wood. According to Chris Sullivan, an expert in the decorative concrete world, the roughsawn look of wood is making a come-back as a desirable finished concrete texture. 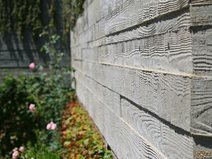 The rough texture of the unfinished wood leaves a recognizable wood grain in the cast concrete surface that many find appealing. Board formed concrete is being used both on the interior and exterior of commercial and residential buildings. To see more board formed concrete check out Concrete & Architecture.